Washington, located along the Potomac River, is the capital of the United States. There are about 600,000 people living in the city, and the entire metropolitan area has about 5.3 million inhabitants. It houses the office of the President, Congress, and other key U.S. government agencies. Also headquarters of the FBI, the World Bank and the International Monetary Fund are located here. The buildings of Washington are also intriguing, as they are radically different from the architecture of other main American cities. The city has been formed by radial arteries connecting two well-known places – the Capitol and White House. The city decided to keep the low buildings, so we do not find the monumental skyscrapers here, well known from other major cities in the United States. Dating in Washington is easy and fun. Here are some ideas for a perfect date. Washington is well known as a national center for the arts. In the John F. Kennedy Center for the Performing Arts you can listen to the National Symphony Orchestra and watch the Washington National Opera, or the Washington Ballet. Washington is a city of rich theatrical traditions. Going to the theater for an absorbing play is a great idea for a date. Among the best theaters in the city we can certainly list Arena Stage, The Shakespeare Theatre Company, and the Studio Theatre. You will be also intrigued by place noted as the U Street Corridor neighborhood located in Northwest DC. It is full of shops, restaurants, nightclubs, art galleries, and music venues along a nine-block stretch of U Street. This place is also widely known as a "Black Broadway" – the heart of the music scene. A number of clubs playing jazz such as Bohemian Caverns and the Lincoln Theatre, which hosted performing artist like Miles Davis and Duke Ellington are located in the neighborhood. If, on your ideal date, you'd rather go to the club where you can listen to the modern blues, you should visit Madam's Organ in Adams Morgan district, or Blues Alley in Georgetown. The most popular and, we believe, the best alternative rock centers are 9:30 Club and The Black Cat, which offer you to see your favorite artists in a more cozy atmosphere. The previously mentioned neighborhoods, Adams Morgan and Georgetown, full of pubs and bars seem to be the best place to taste all flavors of Washington's nightlife. If you can't imagine your perfect date without dance you should go to U Street Music Hall, famous for its excellent sounding and great DJs, or the Caribbean Patty Boom Boom (but do not overdose with the amount of rum consumed). If you both believe in "there is no fun without live music" you must not hesitate to visit the DC9, The Velvet Lounge, or Eighteenth Street Lounge. Salsa lovers will not be disappointed by what Habana Village has to offer. In addition to the dance you will be able to enjoy the delicious food. And try also a mojito, which is considered one of the best in the city. 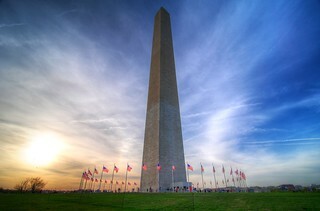 the Washington monument made of marble. Washington is also a city of museums with its Smithsonian Institution – the world's largest museum complex with research and educational centers. It includes the National Museum of American History, National Zoological Park, the National Air and Space Museum, and many, many more.